The era of big bulky furniture has long come and gone. Even with the luxury of space, most people now prefer sleek and seamlessly designed furniture that does not occupy too much space. If you’re on the hunt for such furniture, or if you would like to build your own, here are some great examples of smartly designed furniture that will help you save lots of space at home. Imagine all the floor space that your bed occupies in your room – and how many items you can still fit in that area! And you don’t have to just chuck in your things under your bed anymore. Beds with built-in storage space are designed to provide proper organisation for your stuff, so they’re not placed haphazardly. From spare comforters, blankets and pillows, to seasonal clothes like bulky coats and thermal jackets, your bed can now hold them all – smartly! Have you ever seen Harry Potter’s room under the stairs of the Dursley’s family home? Well, that’s a good example of utilising space under your stairs, although you shouldn’t really put a kid to live in there. You can transform the space under your stairs into a coatroom, hidden shoe rack, or storage space for cleaning items such as vacuum, duster, mop, etc. 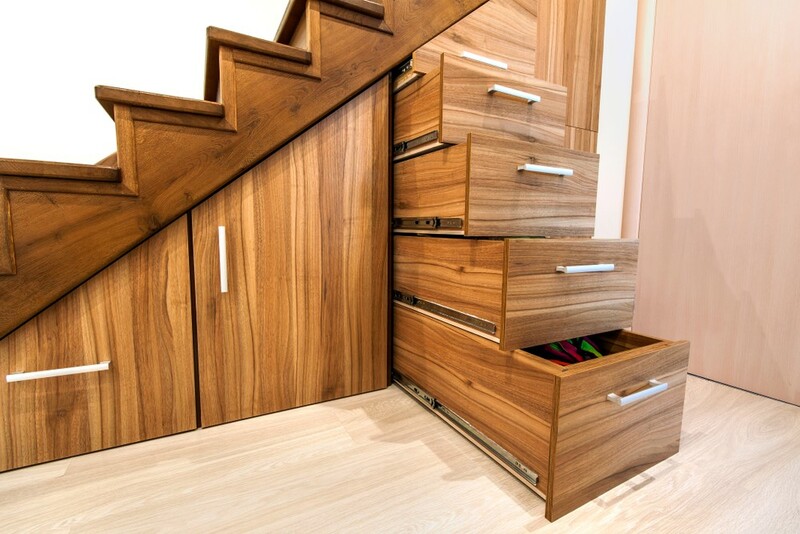 Some creative inspirations even take it further – by transforming the steps of the stairs into pull-out drawers! Pull out pantry cabinets are one of the brightest storage ideas in the modern world. They don’t use up a large amount of space, but they offer A LOT of storage space for all your pantry items. Most of these are designed to be inconspicuous, so if you’re concerned about the aesthetics of your kitchen, this is perfect for you. You can use it as your spice rack and storage for dry food items such as oats, cereals, cookies, wine, tea, peanut butter, chia seeds, honey, condiments and more! Beds that transform into sofas. Bunk beds that have built-in study tables for kids. Coffee tables that double as office desks at home. Sofas that turn into dining tables. The list goes on! Not only are these ingenious, but they also allow you to save space and money in the long run. Because you no longer need to buy two to three furniture pieces to serve different purposes. Now, you can opt for a single piece of furniture that serves various purposes!